Be one of the first to see the new Walt Disney Olaf's Frozen Adventure from just £2.50 + booking fee! Childcare.co.uk have partnered with ODEON Cinemas for an exclusive screening of 'Frozen' followed by a brand new 'Olaf's Frozen Adventure' featurette on Sunday 26th November 2017 at 9.15am for our members and their friends. This really is a unique opportunity - only Childcare.co.uk members and their friends are available to purchase a ticket for this exclusive screening via our invitation only booking page. Amazing Value - adults pay kids prices! Even better, we've a secured a discounted price for the private screening, meaning that both children and adults will pay the same low ticket price from just £2.50 and a 75p booking fee per ticket! 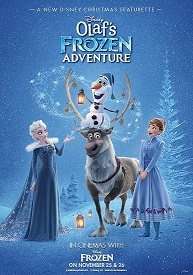 Olaf's Frozen Adventure is an upcoming featurette produced by Walt Disney Animation Studios. It is the third installment of the Frozen series. Book your tickets for our exclusive screening now! We've partnered with ODEON, the largest and best-known cinema chain in the UK to bring you access to this very special opportunity, with screenings available at over 70 ODEON cinemas nationwide! Tickets are strictly limited for this one-off private screening, so book now to avoid disappointment.